property description: The Drôme Valley makes a dramatic divide between northern and southern Europe. Immediately to the north, the farmhouse roofs are shaped to take lots of snow and people earn a living from sheep, goats and cows. Immediately to the south it is all vineyards and olive groves and fields of lavender. Our valley is a rich and curious mixture of the two, and given the huge difference in climate from the river valley up to the mountains, it is possible to see essentially Alpine farms perched high above the Mediterranean ones. The local specialities are a Cremant and Clairette de Die, walnut oil, essential oils, lavender and cheese. Bee keepers and shepherds take their bees and sheep up to the higher mountains in late June and bring them down again in October. There are local festivals celebrating the transhumance and the grape harvest. accommodation: We have converted the old farmhouse (part 12th century, part 18th century) into five gites. The gites are on three floors but because of the way the house is built into the hill, all gites except No.3 have a ground floor entrance. They are all centrally heated, fully furnished and equipped, including bed linen. The kitchens are stocked with basic foods when you arrive and you simply need to pay for what you use. Approached from the main lobby opening from an enclosed courtyard, the gite has a small entrance lobby. To the right is the bathroom with WC, shower and wash hand basin. To the left is the larger of the two bedrooms with a fitted double bed and a window that looks west down the valley. Straight on there is a fitted kitchen and dining room with a window looking north over the lake, and off this is a second bedroom with a high level bunk bed and a double sofa-bed. Suitable for 2-5 people. Approached from the main lobby opening from an enclosed courtyard, the gite opens directly onto a sitting room with a fitted kitchen and dining space and three windows looking east over the courtyard. There is a sofa-bed in an alcove. To the right, two large double doors lead to a bedroom with a fitted double bed. This bedroom opens via a French window onto a west-facing terrace under a lime tree which overlooks the lake. Off the kitchen area is a bathroom with WC, shower and basin. Suitable for 2-4 people. Approached via a flight of stone stairs from the main entrance lobby, the gite opens onto a corridor with east and west facing bedrooms, each with a double bed. The bathroom has a WC, shower and wash hand basin. Straight on, the corridor opens onto a large room with two windows overlooking the lake and one window facing west down the valley. The room is equipped with a fitted kitchen, a wood-burning stove, a dining area and a sitting area with a double sofa-bed. A ladder staircase leads to an attic dormitory with one double and three single mattresses. Suitable for 3-11 people (but there is only one bathroom in the gite). The entrance lobby is approached from the west side of the house. There is a bathroom with bath, shower, WC and wash hand basin off the lobby. To the left there is a living room with fitted kitchen and a window facing west over the forest. There are three rooms opening eastwards from the living room, each with a wiondow overlooking the enclosed courtyard. There are two bedrooms, each with a double bed, and a study. A door from the study allows internal communication with gites 1,2 and 3. Suitable for 2-4 people. Although this gite is on the second floor it is approached via French windows at ground level from a south-facing terrace. The very large main room has three windows facing east over the courtyard and french windows facing west over the forest. There is a fitted kitchen, a wood burning stove and an alcove with a double sofa-bed. Two steps up from the main room there is a bathroom with WC, shower and wash hand basin, one west-facing attic bedroom with a single bed and an east-facing attic bedroom with a double bed. Suitable for 2-5 people. With large windows opening east directly over the lake, the wood cabin measures 5x4 metres. It is equipped with two single beds, a table, chairs, electric lighting and a wood burning stove. A communal bathroom and toilets are about 80 metres away, as also is the canteen. 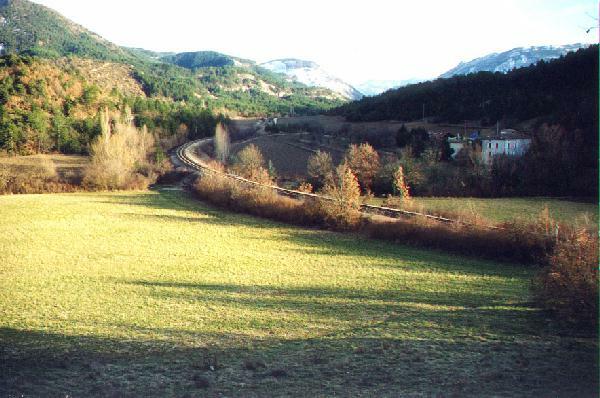 Standing among pine trees, the bus is some 300 metres down the valley from the main farmhouse and looks out over the River Drome. Equipped with a built-in double bed, a living area with wood burning stove, and a fitted kitchen with gas cooker, the bus has water but no electricity. Lighting is provided by paraffin lamps. Suitable for 1-2 people. This little caravan is tucked between wild plum trees at the north end of the lake. It has a double bed and electric lighting. A communal bathroom and toilets are about 100 metres away, as also is the canteen. Suitable for 1-2 people. Another small caravan, sited amongst oak trees at the west end of the lake. It has a double bed and electric lighting. A communal bathroom and toilets are about 100 metres away, as also is the canteen. Suitable for 1-2 people. With a diameter of 5 metres, the yurt is equipped with four mattresses, tables, chairs and a simple kitchen. Normally pitched near a large walnut tree, the nearest drinking water is 50 metres away and there is no electricity, lighting being provided by paraffin lamps. The communal bathroom and toilets are about 200 metres away, as also is the canteen. Suitable for up to 4 people. Bring sleeping bags. If you bring your own tent you can pitch it more or less wherever you like. We charge 2 euros per person per night.